Kolo Fortuny does have some differences from the US version of Wheel of Fortune. For example, it is one of the only shows that have a green podium as opposed to the more commonly used blue color. This alters the color scheme to green/yellow/red. As for the game itself, it consists of one toss up puzzle and then three standard rounds before the bonus round. The toss up puzzle allows the contestant the chance to win either a trip to a hotel in Poland or a dishwasher. The person who solves the puzzle first wins the prize and also starts the first round. If the player is unable to correctly answer the question, the second player is given the opportunity to solve the puzzle correctly. Vowels are worth 200 zloty, which must be bought before the wheel is spun. During the first and third round, a panel with the letters AGD is placed on the wheel. If this panel is stopped on during the rounds, an appliance worth 5,000 zloty is awarded to the player. The second round has prizes that are changed for each show. All three rounds also have a panel that is labeled Wycieczka, which results in a trip to an exotic location if it is stopped on. 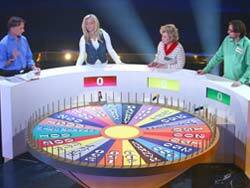 Players spin the wheel one by one, asking for letters and trying to solve a puzzle that is located in front of them. If they solve the puzzle, they are rewarded with a prize, but they must either spin the wheel or purchase a vowel if they are unsuccessful. The rotations continue until someone successfully solves the puzzle. Players are penalized if they hit the Bankrupt space, which results in them losing all money that was earned in the round. This panel is placed on either side of a 10,000 zlot panel. This makes is extremely risky to go for this panel because of the risk/reward ratio. Another penalty is given is a player stops on a stop panel, which results in them losing a turn. This does not affect the total points that the player has earned, however. This method of surrounding the high zlot panel is different than the US version, but is similar to the Filipino and European versions of the show. The Bonus round is played like how it is played in the US. Players spin a small wheel that has prizes like cars, vacations, and cash prizes on it. They are given the letters R, S, T, L, N and E before they choose three vowels in order to solve a puzzle. They are only given 10 seconds to solve the puzzle, which adds to the pressure.